Click on the speakers' images below to read more. Additional speakers to be confirmed. Professor Richard H. McLaren, O.C., LL.B., LL.M., C.Arb. Richard McLaren is a commercial lawyer, arbitrator, mediator, and professor of law with an extraordinary global reputation in sport. He is a longstanding member of the International Court of Arbitration for Sport (CAS) and has been a member of the ad Hoc Divisions of the CAS at five Olympic Games. His positions include a seat on the Strauss Institute, Council of Distinguished Advisors (Pepperdine University), Visiting Fellow, Faculty of Law, Melbourne University, and Chair Emeritus of the Sports Law Institute at Marquette University. Mr. McLaren is President of the Basketball Arbitral Tribunal in Geneva Switzerland and is an elected judge to the FIA International Court of Appeal. He is an Anti-Corruption Hearing Officer for the Uniform Tennis Anti-Corruption Program, Chair of the Anti-Doping Tribunal of the International Cricket Council, and Chair of the Doping Control Board for the Caribbean Cricket Council. Mr. McLaren also acts as the Chief Arbitrator for IRONMAN in respect to anti-doping violations under the IRONMAN Anti-Doping Policy as well as Chief Arbitrator for Anti-Doping Policy Violations for the Ultimate Fighting Championship (UFC). He served as the only non-American advisor to Senator Mitchell in the Major League Baseball Anti-Doping Drug Inquiry. In December, 2014, Mr. McLaren was appointed by WADA to a three person Independent Commission to investigate international doping issues in the sport of athletics (IAAF), and was subsequently appointed as the Independent Person who led the WADA Investigation of Sochi Allegations arising from the previous Independent Commission resulting in publication of the “McLaren Report”. In December, 2015, Mr. McLaren was appointed as an Officer of the Order of Canada. Declan Hill is an investigative journalist, documentary maker and academic. He specializes in the study of organized crime and international issues. He was the first journalist to break the story of Asian match-fixing gangs linked to the multi-billion dollar gambling markets destroying international football in his book ‘The Fix: Soccer & Organized Crime’. It has now become a best-seller in 21 languages. In 2013, he published the academic version ‘The Insider’s Guide to Match-Fixing’ which is now available in English and Japanese. Before publishing ‘The Fix’ Hill completed documentaries on the killing of the head of the Canadian mafia, blood feuds in Kosovo and ethnic cleansing in Iraq. He has also filed articles or made documentaries in Kurdistan, Kenya, France, Belgium, Russia, Bolivia, India, Italy, Australia, South Africa, Germany, Northern Ireland, Brazil, Mexico, Philippines, Turkey and across North America. His programs and articles have appeared around the world in outlets including the New York Times, Toronto Star, Guardian, BBC, CNN International, CBC and PBS Frontline. Hill has also won a number of national and international awards from organizations such as Amnesty International, the Canadian Association of Journalists and Play the Game. He has also been interviewed in over-800 media outlets in more than 60 countries including Al-Jazeera, Sky News, BBC, Le Monde, Der Spiegel, El Pais, De Morgen, Il Manifesto, Hürriyet, Le Matin and ABC (Australia). He has also testified about the new wave of match-fixing linked to globalisation before committees at the Council of Europe, the European Parliament in Brussels, the UK Parliament in Westminster and the International Olympic Committee. Hill was a Chevening Scholar at Green College, University of Oxford where he obtained his doctorate on the study of organized crime and informal governance, with a particular specialty in match-fixing in professional sports. He has published numerous academic articles and book sections about sports corruption and is recognized as one of the world’s leading experts on the subject. He originally joined the CCES in 1991 as Director of Education and Communications, and was with the Centre for eight years prior to leaving to pursue an opportunity in the high-tech industry as Regional Vice-President with In-Touch Survey Systems Inc. Paul’s passion for promoting sport in Canada that is positive, values-based and principle-driven resulted in his return to the CCES. Paul plays a leadership role in managing the CCES’ operations, which includes the administration of the Canadian Anti-Doping Program, leading the growth of the True Sport Movement in Canada and working with the federal, provincial and territorial governments and other sport. Paul is currently Chairperson of the True Sport Foundation and he also works extensively in the international arena promoting ethical and doping-free sport. He served as the first President of the internationally based Association of National Anti-Doping Organizations from 2002-2006. Paul is a graduate of the University of Ottawa with a Masters degree in Health Administration. Prior to joining the CCES, Paul was Chief of the Tobacco Programs Unit at Health Canada where he was responsible for the direction and management of the Department’s tobacco use reduction strategies. Over the course of his career, working on a variety of health and social issues, Paul has developed extensive knowledge and expertise in the development and implementation of public awareness, education and social change campaigns. His leadership skills have been characterized by a clear vision, results-oriented approach to the management of a wide range of public issues. Jeffrey Mishkin joined the New York office of Skadden, Arps as a partner on January 1, 2000, after serving for seven years as Executive Vice President and Chief Legal Officer of the National Basketball Association. He continues to serve the NBA as its chief outside counsel. As Executive Vice President and Chief Legal Officer, Mr. Mishkin oversaw every aspect of the NBA's legal affairs, including all litigation, labor relations, commercial transactions, legislation and enforcement of the league's intellectual property rights, personally trying and arguing the NBA's most important cases. Mr. Mishkin has participated in every major legal decision that has affected the NBA in the past 35 years. Since coming to Skadden, his sports practice has expanded to include representation of the PGA Tour, National Football League, National Hockey League, Major League Baseball, National Collegiate Athletic Association, United States Tennis Association, Major League Baseball Advanced Media, Collegiate Licensing Association, Madison Square Garden, New York Knicks, New York Rangers, New Jersey (now Brooklyn) Nets, Boston Celtics, Phoenix Suns, Toronto Raptors, Toronto Maple Leafs, Denver Nuggets, Miami Heat and many other sports organizations. Among other notable matters, Mr. Mishkin has represented the NCAA, NFL, NBA, MLB and NHL in litigation over the constitutionality of federal legislation prohibiting states from gambling on sporting events. The New York Times has described Mr. Mishkin as "one of the country's most prominent sports lawyers." David Howman CNZM is the Chair of the Athletics Integrity Unit, having been appointed to that position by the IAAF Council in April 2017. He is also currently Chair of the World Squash Ethics Commission, was a member of the Australian government’s Panel reporting on Sport Integrity, and holds the position of Adjunct Professor at Auckland University of Technology. David was Director General of the World Anti-Doping Agency (WADA), from 2003 to 2016, and was instrumental in the shaping of WADA into a highly respected and unified global organization responsible for regulating and monitoring world sport and world governments. Among the many partnerships he forged globally was a pivotal one with Interpol culminating in a MOU signed in 2009. David began his time with WADA as a Foundation Board member representing Oceania, when WADA was established in 1999, and served as Chair of the Legal Committee. He was Deputy Chair of the Independent Anti Doping Observer team at the 2000 Sydney Olympic Games, and the Chair of that mission at the 2002 Winter Olympic Games in Salt Lake City. Among other positions David has been Chair of New Zealand Tennis, Fair Play Citing Commissioner for SANZAR and New Zealand Rugby, a Board member for the Hillary Commission for Sport (now Sport New Zealand), and a Board Member of the New Zealand Sports Foundation. David practises as an independent Barrister in Wellington. Luisa’s practice encompasses a wide variety of areas, including administrative law; professional regulation; and general civil and commercial litigation. She is preferred counsel for LawPro, having acted on its behalf on a number of court motions. Prior to joining the Firm in 2001, Luisa clerked for the Divisional Court, General Division, Ontario Court of Justice in Toronto. Luisa has been a partner since 2006 and a member of the Firm’s management committee since 2008. She is an adjunct professor for the Trial Practice Course at Osgoode Hall Law School and a team leader for the Intensive Trial Advocacy Program (“ITAW”). Luisa has been involved in three judicial inquiries, including serving as co-counsel to the Office of the Chief Coroner in the Inquiry into Pediatric Forensic Pathology (the “Goudge Inquiry”), counsel for the North York General Hospital nurses during the SARS review, counsel for Peter McCallion in the Mississauga Judicial Inquiry, and counsel to the Association of Professional Engineers of Ontario in the Elliot Lake Inquiry. In 2013, Luisa was appointed by former Chief Justice Warren Winkler to act as court monitor in the administration of two pan-Canadian settlements involving the tainted blood scandal, as well as the settlement involving water contamination in Walkerton, Ontario. In February 2016, Luisa received an Order-in-Council appointment as a part-time member of the Licence Appeal Tribunal, Fire Safety Commission and the Animal Care Review Board. In that role, she has conducted a number of hearings and case conferences. Luisa is counsel for the Canadian Centre for Ethics in Sports and has appeared on a number of anti-doping cases over the last several years. In addition, Luisa acts for students facing academic and non-academic related charges at secondary and post-secondary institutions throughout the Province. Luisa also acts as independent legal counsel for a number of regulated health colleges and administrative tribunals throughout the province, including the College of Opticians of Ontario, the College of Naturopaths of Ontario, the College of Midwives of Ontario, the College of Veterinarians of Ontario, the Human Resources Professional Association and the Ontario Motor Vehicle Industry Council. In this role, Luisa provides substantive and procedural advice during hearings, as well as ongoing training for adjudicators. Paul Burns was instrumental in establishing the Canadian Gaming Association (CGA) in 2005, recognizing the need for a unified voice for the gaming industry in Canada. Under his leadership as the CGA’s Vice President, the association grew to include the industry’s leading operators, manufacturers, and suppliers nation-wide. Mr. Burns was appointed the CGA’s President & CEO in March 2018. Mr. Burns’ focus is on critical areas addressing legislative and regulatory issues and providing leadership on emerging issues. He is a seasoned public affairs practitioner with more than 20 years’ experience in the private and public sectors. Prior to his role with the CGA, Mr. Burns served as Corporate Compliance Officer for RPC Gaming, a Canadian-based gaming company that operated a chain of gaming establishments in Las Vegas, Nevada. He also served as Vice President, Corporate Affairs, for RPC Anchor Gaming, and worked with the Government of Ontario to develop charity casinos in the province. Mr. Burns specializes in policy development and implementation and has held key policy roles at all levels of government. As policy advisor to the Ontario Minister of Consumer and Commercial Relations, he directed government initiatives in the gaming sector that included the expansion of gaming in Ontario in such areas as the introduction of slots at racetracks. During his long career as a civil servant, Harri Syväsalmi has had several director positions in the Finnish Ministry of Education and Culture (from 1990). He has also worked as a Counsellor in the Permanent Representation of Finland to the European Union (2006-2010) and chaired two of the EU Council of Ministers´ expert committees; the Cultural Affairs Committee and Youth Working Party during the Finnish EU Presidency 2006. As a Councellor of gaming issues he attended to EU Council´s Working Party on Establishment and Services 2007-2010. Before his retirement, from June 1, 2016 until December 31, 2018 he worked as a Secretary General of the Finnish Center for Integrity in Sports. Mr Syväsalmi has been actively involved in the international work for safeguarding the integrity of sport. He participated in the establishment of the World Anti-Doping Agency where he served as the first Secretary General (2000-2001) and Director General (2002-2003). He has co-chaired the EU Council´s Expert Group of Good Governance (match-fixing) 2011-2014 and chaired EU Council´s Expert Group on Match-Fixing 2014-2016. Syväsalmi also chaired the Council of Europe Drafting Group of the International Convention on Competition Manipulation as well as its sub-group related to sports organizations 2012-2014. He was a vice chair of the National Advisory Board for sport-related ethical issues 2015-2016 and a chair of its Steering Committee i.e. National Platform 2015-2018. Mr Syväsalmi has been a speaker and chair in many national and international events. He chaired Council of Europe´s 3rd International Conference on the fight against the manipulation of sports competitions in September 2018 and was one of the keynote speakers of the EU Erasmus+ Sports Cluster meeting in December 2018. Andy joined Sportradar in 2013 and is a senior leader in the company’s Integrity Services department who support over 100 sports governing bodies, law enforcement agencies and state authorities around the world counter betting related match-fixing and sporting corruption through their innovative and proven bet monitoring, intelligence, audit and education services. This includes working with the NBA, NHL, NASCAR and MLS in North America as well as FIFA, World Rugby, International Cricket Council and the International Tennis Federation globally. Before joining Sportradar in 2013 Andy setup and led the Integrity Team at global betting exchange Betfair for nearly 10 years. He has over 15 years’ experience in the field of sports betting integrity and has assisted numerous betting operators, sports governing bodies, law enforcement agencies, governmental departments and state betting regulators around the world with the prevention, detection and investigation of betting-related corruption and match-fixing. Andy has acted as an expert witness in match-fixing related sporting disciplinary and criminal court case proceedings on several occasions and has been part of IOC and United Nations expert working groups on countering match-fixing. Earl Cochrane has been a Senior Sports Executive for 20 years. He is presently the Chief Strategy and Development Officer for Canada Soccer, where he is responsible for key growth and strategic initiatives that affect the largest participation sport in Canada. Prior to his existing role, Earl was the Deputy General Secretary of Canada Soccer where he oversaw soccer administration in Canada, including sport governance, integrity, discipline and appeals, international and domestic player registration and transfers and all national competitions. 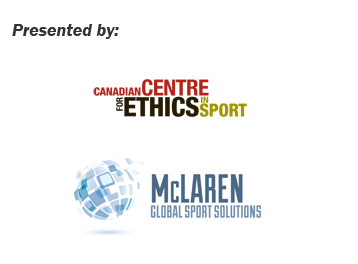 He was also responsible for relations with Canada Soccer’s Member Associations, professional leagues and clubs and other international and national organizations such as FIFA, CONCACAF, COC, Sport Canada, and Canadian Centre for Ethics in Sport. In 2006, Earl started a eight-year stint with Maple Leaf Sports & Entertainment where he was a key senior leader that helped to launch Canada’s first Major League Soccer club, Toronto FC. At Toronto FC, he held several senior roles including Director of Team & Player Operations and General Manager. Before kick-starting his off-field career in 1999 in Washington with DC United, Earl played soccer professionally in Asia and was a three-time All-Canadian defender at Carleton University in Ottawa, Canada.